Not danced since you were a teen, or a former professional dancer? 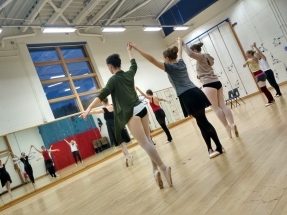 No matter where you are in your dancing, Ballet Bristol has a place to offer you. We have open ballet classes for adults at two levels, and if you want be in costume performing dances from the greatest ballets, you can be part of our ballet company. We meet every Wednesday for three hours of ballet classes and repertoire development. We work hard, but have fun, and it’s a relaxed environment to develop your ballet technique. If you’d like to come and join us, then just email us at team@balletbristol.co.uk and we’ll set you up with all the information you need. If you’ve got questions about things like what to wear or what level class to try, have a read of our welcome letter. (Sorry, but you need to be aged 18 or above to attend our classes). March 2019 – the PL1 class is currently full, but email us and we’ll let you know when spaces open up. 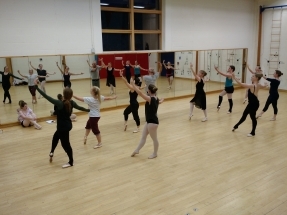 New Starters – classes ideal if you’re nervous about joining Ballet Bristol, as you’ll be with other new people. They’re about every 6 weeks. Repertoire – time assigned to learn dances in groups or solos, working towards performances. The first twenty minutes is allocated for pointe work (ladies) or men’s jumps and turns. Classes cost £6 for either PL1 or PL2, or £7 if you do both PL1 and PL2 together. You can attend Repertoire class for free if you’ve been at either PL1 or PL2 that evening. You’re welcome to come to your first couple of classes without becoming a member. If you decide to stay, there’s an annual membership fee of £18, which covers our insurance costs. We hold all our classes at Bradley Stoke Community School. Directions and details of where the Dance Studio is located within the school are on the Contact Us page.